Mikael Colville-Anderson's has an interesting TED talk on Bicycle Culture by design. In it he speaks about "desire lines", the mapping of the path people actually want to take, and how that idea can used to improve bicycle path design. 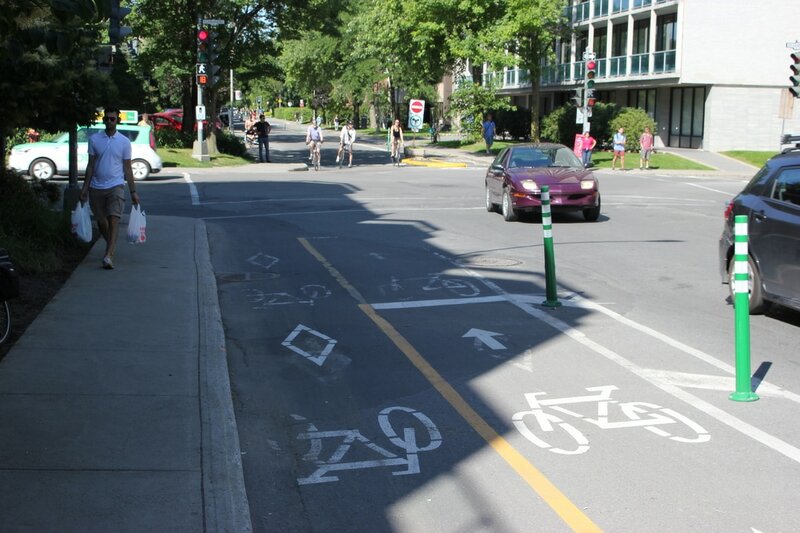 This idea could be applied for the de Masionneuve path's Claremont intersection. 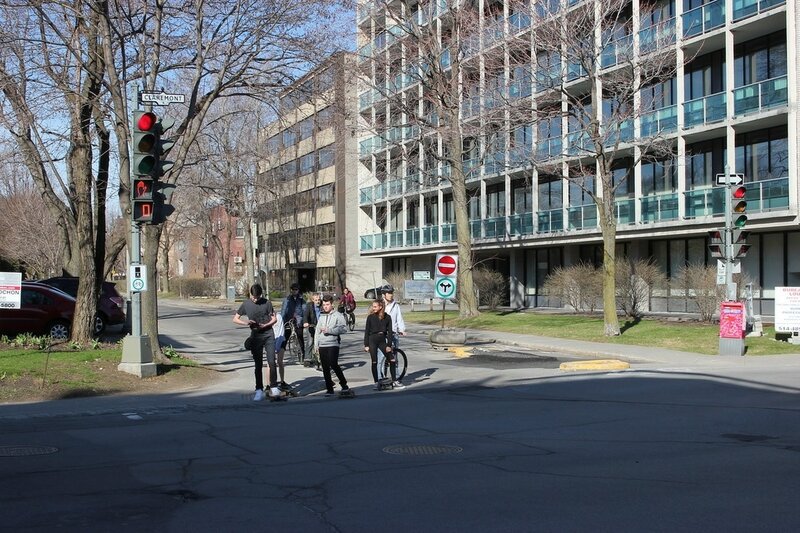 By watching the actual behaviour of cyclists as they approach the intersection, headed westwards, one sees that most switch from the south to the north side before they reach the intersection. The majority of the cyclists waiting to cross do so on the north side of the street, not the south as the line painting falsely indicates. 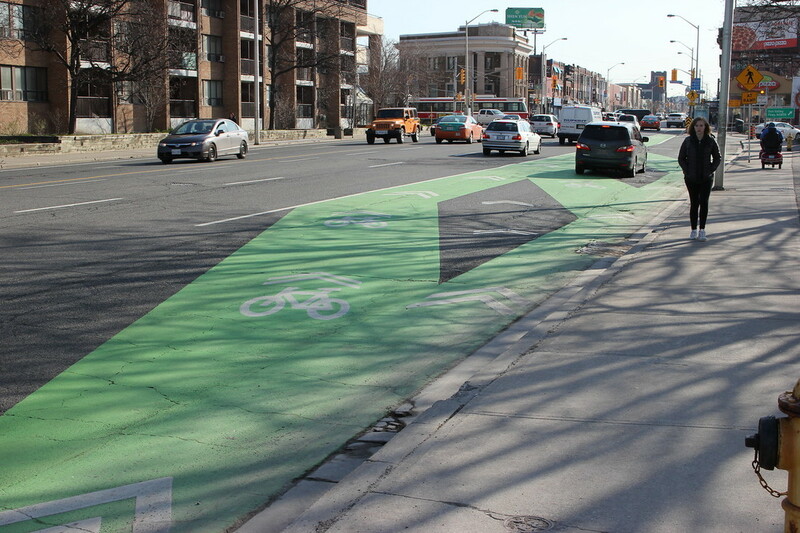 The city could paint diagonal arrows on the western approach to the intersection to warn drivers that this is the actual behaviour of cyclists, and add a bicycle box at the intersection so that there is space on the north side for cyclists to wait. View of Claremont intersection with true bicycle paths indicated. Car drivers would clearly know when they were crossing a bicycle path. Traffic light signal at Claremontt, seen from westbound south side of street, bicycle within green circle is supposed to indicate that cyclists are to use walk not green signal. 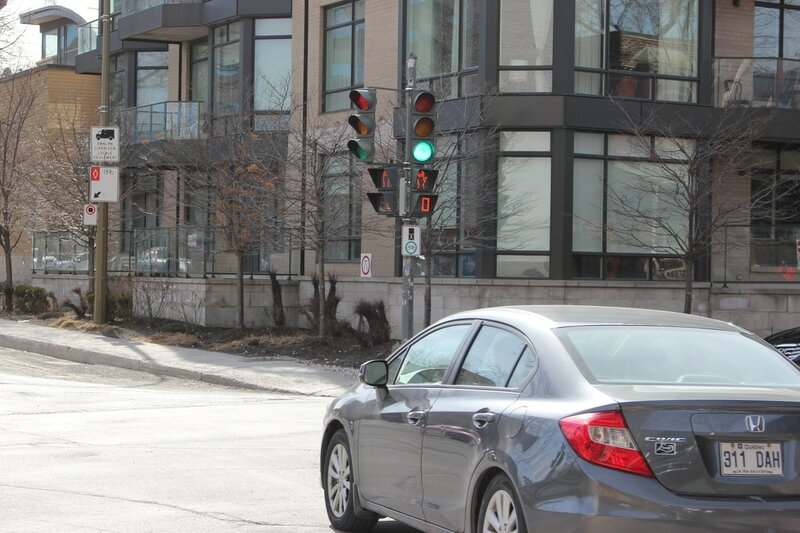 Cyclists are supposed to wait on green signals for cars to pass. 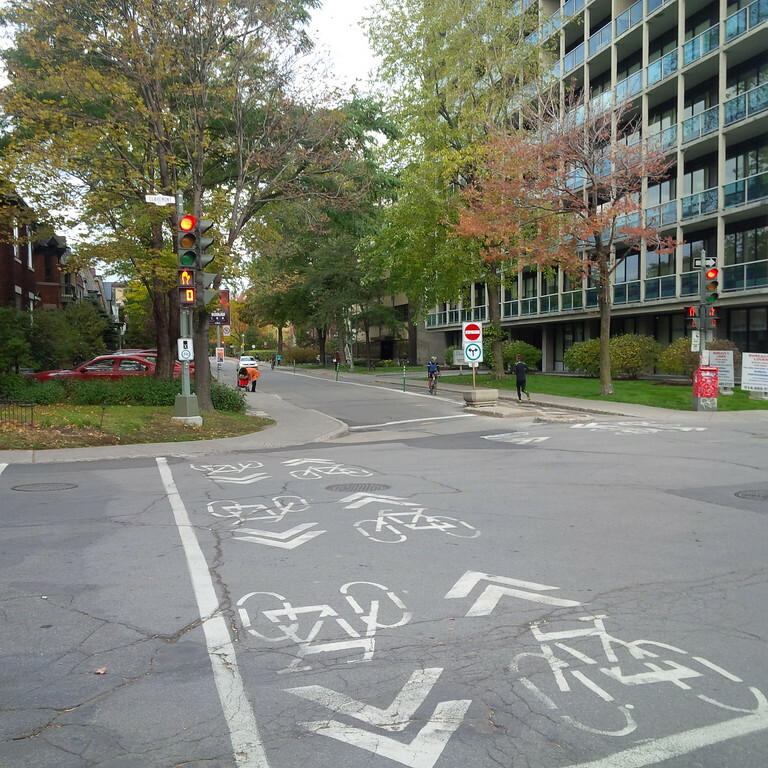 The only safe time period for cyclists to cross Claremont is during the walk signal. This is very poorly indicated by a confusing signage and should be replaced by a bike light that is green during the walk signal only. Westbound cars approaching the intersection are given no warning that bicycles are likely to merger into their lane as they attempt to go to the north side of the street. 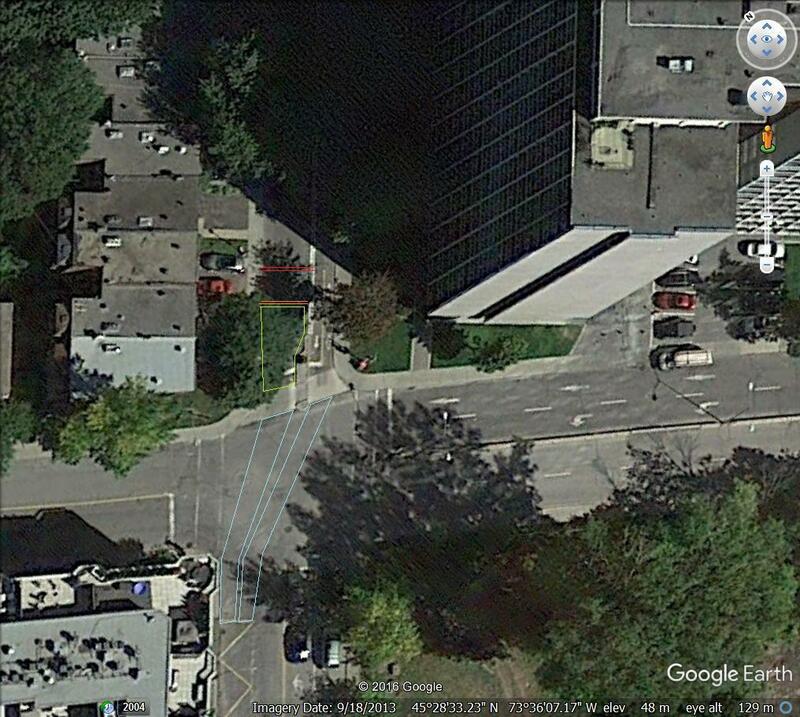 Use of diagonal arrows before the intersection could fix that problem. 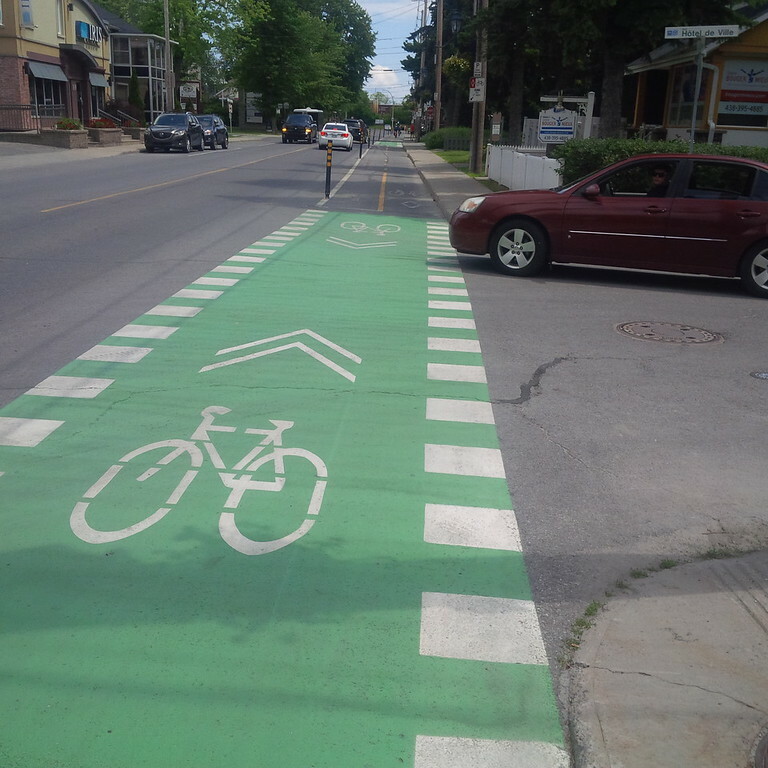 A painted bicycle box on the west side of Claremont would give cyclists space to wait, acknowledging that is the accepted practice today. Inevitably some cyclists will go through the intersect on a solid green light as they do today, however if the intersection was painted with the true cycle paths indicated at least car drivers would be aware of when they are crossing a cycle path. The present intersection lacks a clear traffic light system, approaching diagonal merging arrows, a bicycle box waiting zone and has no road painting within the intersection. It should be redesigned. 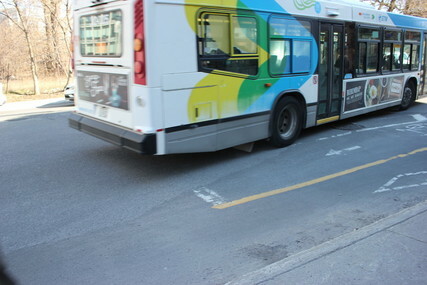 On the west side of the intersection, the turning radius of buses enters the waiting area of cyclists. Again the road painting could be improved by setting the cycle stop line further back and a warning to cyclists of the danger of turning buses. In early July 2017 this was fixed as an updated photograph shows! Claremont Intersection July 2017, showing revised stop line painting. Still no markings within intersection or Bicycle waiting box on east side however. Photo of bicycle crossing within an intersection taken in Dorion 28 June 2017 path near Vendome station in NDG. 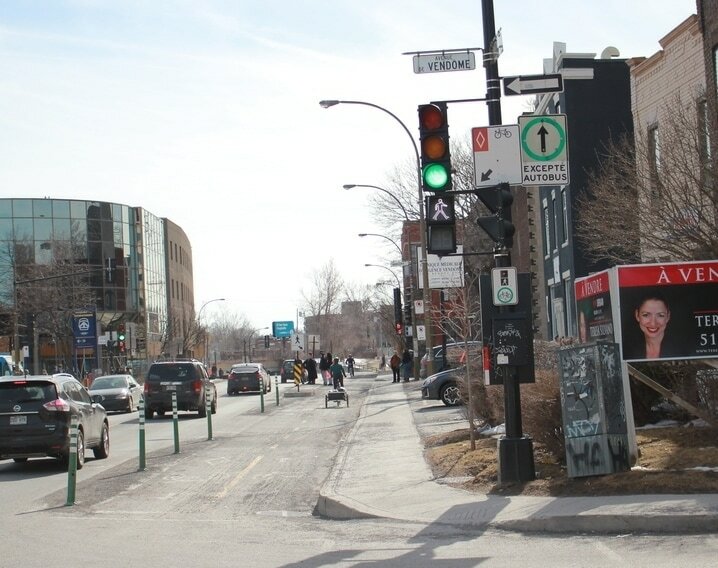 The intersections near Vendome give less warning to crossing cars. They also wear off over the winter such that they are useless by early spring, a solid coloured marking would hold up better.